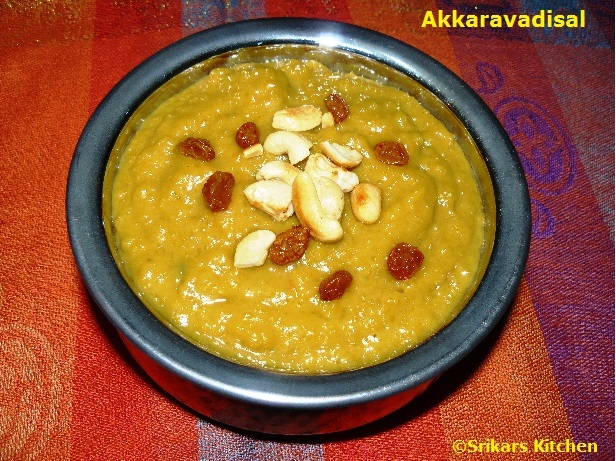 Akkaravadisal is similar to Sakkarai pongal with little variations. This is a very traditional dish in iyengar families. Akkaravadisal is famous prasadams of Vishnu temples.My mom is used make this recipe while doing some Vishnu poojas , Aadi velli and thai velli at home. This is very tasty & mouth watering recipe. Take a pressure cooker or pan add 1 tbsp ghee, add rice and moong dal & saute until little roast. Add two cups of water with milk , cardamom, nutmeg powder & cook upto 3 whistle. Allow it cool . Mash it with laddle & add rest of milk & jaggery. Allow to dissolve it. Add sugar & allow to dissolve it. Add saffron soaked milk & Mix well. Heat ghee in a pan, add cashew nuts, raisins & roast it & add to akkaravadisal.